The World’s Largest Toy Museum is a nice attraction in Branson where you can reminisce your childhood days and experience the feeling of being young again. See the timeless gallery of toys including great displays of trains, dolls, and puppets. 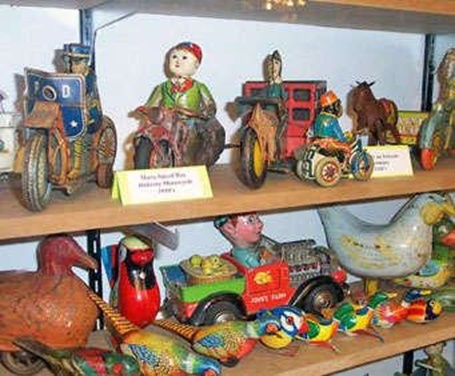 This museum attraction is home to different kinds of toys way back from the 1700s to the present. Rediscover the fun of appreciating your favorite toys and see your childhood heroes such as Shirley Temple, Tom Mix, and Groucho Marx. You can find toys from among the more than a millions on display as tiny as a thimble and as big as a full-size luxury car. Inside the museum, you will find everything including old fashioned board games such as Break the Bank and Clue and other fun additions that children love like B-B guns, Cushman motorcycles and Cap Pistols. The museum also features more than 100 antique toy trains and many other types of miniature toys, ranging from exciting action figures such as General Lee from the old television show, Dukes of Hazzard. Roaming around the huge toy attraction will give you the opportunity to peer into a timeless place where reminiscence unfolds and imagination abounds. Once you are inside the World’s Largest Toy Museum, you are free to get through the Harold Bell Museum which is included in your ticket. If you had a great fun experience with the miniature toys during your childhood days, you will certainly love this behemoth toy store which offers a great display of cars, trucks, tractors, and trains. Every corner in this toy museum is filled with toys, board games, boxes, dolls, rides and many other great collection of toys way back from the past three centuries to the present. Here, you will find old designs of ships, planes, trains, classic cars and motorcycles, pedal cars, bicycles, tin wind-ups, dolls, Star Wars, Disney characters, trucks, G.I. Joes, and toy soldiers. This is a must-see collection of toys in the museum. This gigantic museum in Branson features millions of toys of different shapes and sizes. Almost all types of toys imaginable can be found in this amazing museum. From the collectible legos to an actual size classic cars and farm trucks, the museum can be a fun place for everyone. Toys of all types can be found in this fantastic museum – from doll houses to Star Wars where ladies grew up with stuff for the boys like General Lee items, John Deere memorabilia, and much more. Cartoon characters like Popeye, Gene Autry, Howdy Doody, Buffalo Bob, Power Rangers, the list goes on – you can find all of them in one roof. There are also many interesting items on display in the museum that include Disney collectibles and memorabilia, action figures, cast iron toys, and much more that you don’t want to miss. In this beautiful toy attraction, you will remember the memories you enjoyed when you were young. So, if you want to take a glimpse into America’s amazing history of toys, visit the World’s Largest Toy Museum in Branson.